This is the same content that was sent out in the January 2019 newsletter. Click the subheadings to expand the content. Thank You for Our Best Financial Year Ever! MicroGrants had a stunning 2018. Total revenue was up 30% from 2017. Thanks to our increased revenue, we gave out about 31% more in grants last year than we did in 2017. Our average grant amount has also increased. We accomplished all of this while staying within budget with respect to our expenses. Our exact figures will be published in our annual report, which will be released in the spring. Our education grantee Eliphaz perfectly exemplifies our gratitude and the gratitude of those directly affected by our grants. Watch a video of grantee Eliphaz thanking donors. Thank you so much! Joe Selvaggio, MicroGrants’ founder and former CEO, chaired his last board meeting on Thursday, December 20, 2018. Joe is a social entrepreneur with a decades-long record in the Twin Cities nonprofit community. We are so grateful for his leadership at MicroGrants! Joe grew up in Chicago, and his first career was as a priest. After leaving the priesthood, he founded Project for Pride in Living in Minneapolis in 1972. Its goal was and is “to create affordable housing and revitalize central Minneapolis,” according to PPL’s website. Once PPL was well-established, Joe left and founded the One Percent Club. This organization urged wealthy Minnesotans to donate at least one percent of their net worth, rather than a percentage of their income, to charity every year. In 2006, Joe founded MicroGrants, having been given $50,000 of seed money by two friends. He was MicroGrants CEO for ten years, growing it from a small enterprise based out of his basement to the sustainable and vibrant organization it is today. For the past several years, Joe has served as board chair. 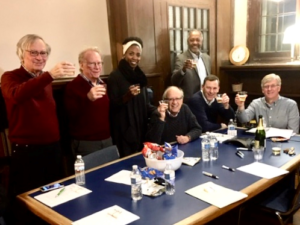 As he stepped down from that role, the board asked him to honor MicroGrants as a board member for life, and Joe graciously accepted. Pivot Strategies, a local public relations firm with clients such as Nike, Medtronic, and Thompson Reuters, has decided to take Lights On! as their nonprofit account. Most of Pivot’s work will be done pro bono. Pivot Strategies aims to solidify Lights On!’s key messaging, identify principal audiences, and create effective materials for expansion. We are deeply grateful for Pivot’s interest in working with Lights On! and excited about the improvements they will bring to the program! Because of the gift from the Joyce Foundation, MicroGrants is able to work with Pivot Strategies on this critical portion of the Lights On! program without using donor dollars. The Minnesota Police Chief magazine ran a three-page feature on Lights On! in their fall 2018 issue. What follows are excerpts from the article. 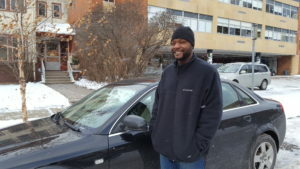 MicroGrants is now accepting donated cars for our transportation grant program. Car donations can be taken to any Bobby and Steve’s Auto World location. Bobby and Steve’s will assess its value and determine if repairs are necessary.